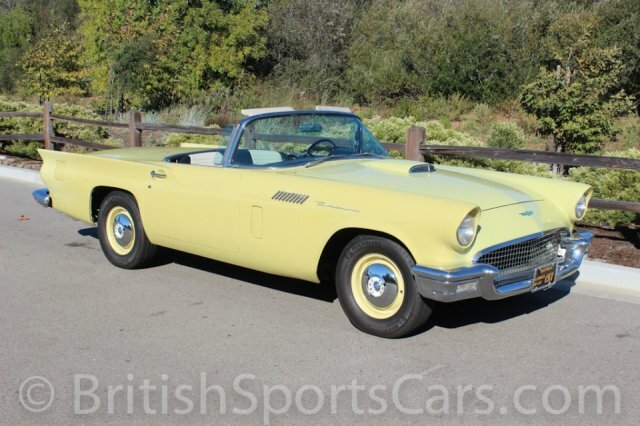 You are looking at a 1957 Ford Thunderbird, Inca Gold with White Porthole Hardtop, with a White Vinyl soft top that's in older condition and has one small rip. Black & White Vinyl Interior, Thunderbird Special V8 312ci/245hp 4V with Engine Dress Up Kit, Power Steering & Brakes, Fordomatic Transmission, Dual Glass Accessory Wind Wings, 'Dialamatic' Seat. Original 'Signal Seek' radio replaced with AM/FM Cassette Player by previous owner. Electric Window Lifts, Telescopic Adjustable Steering Wheel, Matching Fender Skirts, 4 Newer Michelin X Blackwall Radial Tires P205/75R14, mounted with 'Dog Dish' hubcaps. 4 Full-Sized Wheelcovers included. Original Factory Invoice (Date Release and Accounting Invoice from FOMOCO, dated 9/05/57) included, showing that the car was originally sold at Cort Fox Ford, 4531 Hollywood Blvd., Hollywood, CA for $3433.87. Included is a Chicago Electric Power Tools 440lb Electric Hoist with 'Easy Lifter' hardtop remover bar. The paint job is older and looks great but does show some wear and tear. 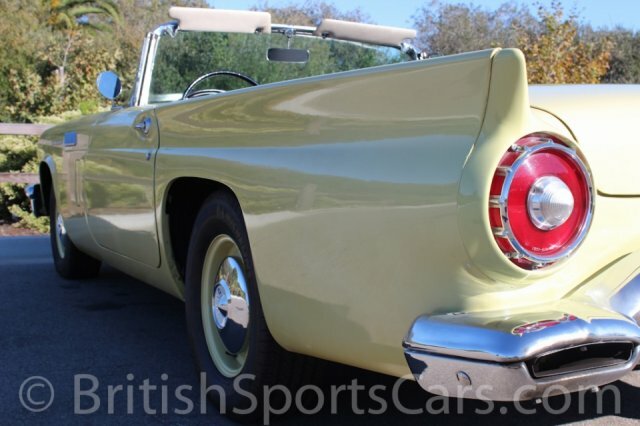 The paint has also been blended on the front hood area and the rear deck lid area which shows in certain lighting. Please don't hesitate to contact us with any questions.